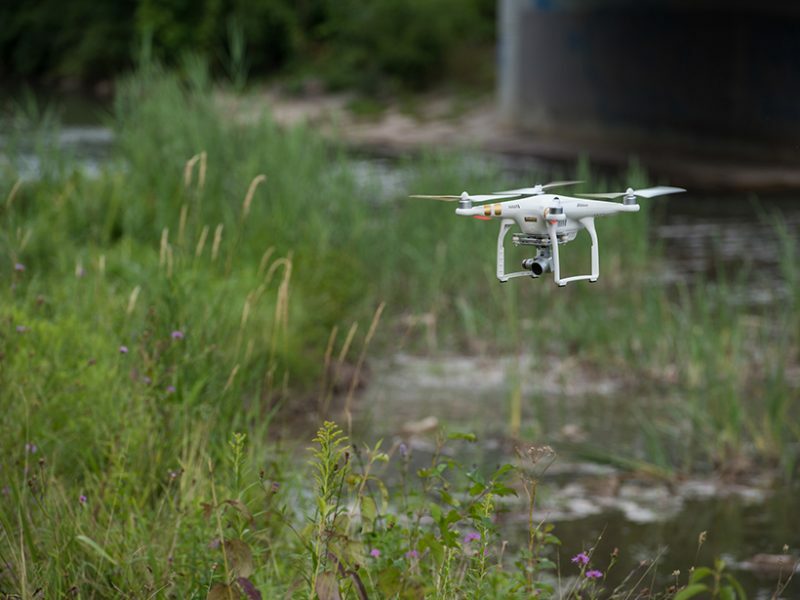 A quadcopter is deployed to collect visual and thermal imagery along Onondaga Creek in Syracuse, N.Y. Credit: Syracuse University photo by Steve Sartori. In the digital age, our capabilities for monitoring Earth processes are dramatically increasing, offering new opportunities to observe Earth’s dynamic behavior in fields ranging from hydrology to volcanology to atmospheric sciences. The latest revolution for imaging and sampling Earth’s surface involves unmanned aircraft systems, also known as unmanned aerial vehicles, remotely piloted aircraft, or, colloquially, drones. Drones come in a variety of shapes, sizes, and platforms. These include several different designs (single rotors, multirotors, hybrids, and fixed-wing platforms) that can be used to carry many different types of payloads, including sensors, cameras, and sampling equipment. More important, drones are now applied toward a range of objectives for assessing dynamic processes in two, three, and four dimensions, revolutionizing our ability to rapidly collect high-quality observations across Earth’s surface. The geosciences community at large has taken to the skies, with a broad spectrum of researchers using an array of drone platforms and sensors or samplers in several unique and innovative applications. The codevelopment of drone technology alongside new sensor technology is paving the way for drones to be used as more than just Earth surface imagers. This opens a world of possibilities for Earth science research. A review of the geosciences literature shows that drones are now actively applied toward several objectives and across many fields (Figure 1). The latest generation of drones is especially versatile because these drones can carry payloads of sensors and sampling equipment capable of collecting an impressive variety of images, physical samples, and synoptic measurements. 1. Drones characterize topography. In recent years, drones have increasingly assisted with the photogrammetry technique known as structure from motion (SfM), where 2-D images are transformed into 3-D topographic surfaces (Figure 2). This technique provides high-resolution topographic imagery, which can be used to augment existing topographic data as well as to identify microtopographic features like small water channels on the surface of a glacier. In a study by Rippin et al. , SfM techniques used drone imagery to produce high-resolution digital elevation models over the lower reaches of a glacier in Svalbard. The team then used the models to identify minor channels that were altering the roughness of the ice surface. Because roughness alters energy exchange, the findings of this study have implications for understanding the energy balance of glaciers. SfM is relatively inexpensive compared with traditional survey methods such as lidar, and it can be used with off-the-shelf software available for imagery postprocessing and development to produce high-resolution digital elevation models (DEMs). 2. Drones assess hazardous or inaccessible areas. Drones are particularly useful for acquiring imagery or measurements over locations that are hazardous or difficult to reach on foot. In one early example, McGonigle et al. acquired measurements of volcanic gases using a quadcopter outfitted with spectrometers and electrochemical sensors within the La Fossa crater (Vulcano, Italy). The study set the benchmark for quadcopter use in volcanology and its ability to measure carbon dioxide flux and enhance eruption forecasting. In another example, Brownlow et al. deployed octocopters to monitor methane (CH4) dynamics both above and below the trade wind inversion on Ascension Island in the South Atlantic Ocean, an ideal location for characterizing tropical background methane concentrations. The octocopters operated at high elevations, sampling methane at altitudes up to 2,700 meters above mean sea level. The researchers then used observed air chemistries to delineate chemical signatures that indicate sources of air masses at various altitudes. The study demonstrated ultimately that atmospheric monitoring via drones can reveal spatial complexities (e.g., the air column) that are often missed by sampling at the surface. In another innovative application, Ore et al. designed and deployed a quadcopter capable of collecting water samples from rivers and lakes. These researchers successfully applied their system, which can collect three 200-milliliter water samples under moderate wind conditions, during more than 90 different missions on lakes and waterways. Such efforts present an exciting path for monitoring environmental hazards or disasters such as oil spills, tracking waterborne diseases, and sampling remote locations. 3. Drones image transient events. Drones are ideal for mapping nutrient blooms, sediment plumes (Figure 3), and floods, examples of ecosystem and landscape responses that may occur for only short periods of time. Spence and Mengistu  demonstrated the use of drones to identify an intermittent stream network in the St. Denis National Wildlife Area in Saskatchewan, Canada. The authors also found that drone delineation of narrow intermittent streams consistently outperformed delineation with multispectral SPOT-5 satellite imagery (10-meter resolution). In fact, training SPOT-5 delineation on drone imagery did not improve classification accuracy, suggesting that high-resolution drone imagery may be one of the few tools capable of capturing continuous images of fluvial dynamics at relatively fine scales. 4. Drones contextualize satellite and ground-based imagery. With the proliferation of satellite data products, comparisons between drone-collected data and satellite imagery offer a pathway for reconciling data collected at multiple spatial scales. This nested approach was used by Di Mauro et al. to examine how such impurities as mineral dust may alter snow radiative properties in the European Alps. They used a combination of snow sampling, red-green-blue imaging with quadcopter drones, and Landsat 8 imagery, producing local and regional maps that demonstrated the effects of snow impurities on snow albedo. These impurities directly affect snow surface energy exchanges at many spatial scales, so these researchers’ findings are useful for climate modeling as well as for mapping potential feedbacks between snow surfaces and energy exchange. 5. Drone imagery validates computational models. Drone-collected data have also been used to constrain model inputs or to compare data to model simulations in many different fields across the geosciences. One growing application is the spatial modeling of stratigraphy (the sequencing of rock layers in a formation). Drones have the potential to revolutionize assessments of spatial patterns of Earth processes, as demonstrated by two recent studies. Nieminski and Graham  describe modeling stratigraphic architecture to characterize difficult-to-access outcrops in the Miocene East Coast Basin in New Zealand. They demonstrate how 3-D SfM alongside 2-D visual imagery can enable interpretations useful for both research and the classroom (Figure 4). Drones are also commonly used to create model inputs. Vivoni et al. demonstrated that fine-scale data collected via drones may be particularly useful for generating distributed hydrologic models. The authors describe several different drone-derived data sets, including elevation models and maps of vegetation classification, at resolutions ranging from about a centimeter to a meter that were used as inputs to a spatially distributed watershed model. Such applications may be useful in places where inputs with resolutions finer than 10 meters are desired but may not yet exist. 6. Drones make the world a better place. Beyond the research world, the drone revolution is spilling over into many everyday humanitarian and environmental applications around the globe. DroneSeed, a company based in Seattle, Wash., is using swarms of off-the-shelf drones to control invasive vegetation with herbicides. The company aims to use drones to identify microhabitat sites ideal for tree planting, deploying biodegradable seedpods, and protecting tree development by limiting invasive vegetation growth. They seek to replant large areas of rough terrain with a fraction of the manpower required to perform the same work on foot. Meanwhile, conservationists are protecting vulnerable, threatened, or endangered species using drones. For example, the nonprofit organization Leatherback Trust is tracking leatherback sea turtles via drones, enabling professionals to follow the turtles to locate and observe their nesting sites, rather than painstakingly identifying nests on foot. And even more uses abound. For instance, in the wake of recent hurricane disasters in the southern United States, drones were used in search and rescue operations as well as for infrastructure damage assessment [Moore, 2017]. As drone use has evolved, so has the regulatory landscape. In the United States, regulations distinguish between recreational operations and operations that are commercial and professional in nature, including research efforts [Federal Aviation Administration, 2017]. These regulations specify the necessary training and certification for remote pilots, and they lay out conditions for safe operation. Regulations vary among countries and localities; thus, anyone planning to use unmanned aircraft in a research program must review the applicable rules and obtain the required permits and certifications during the project planning stages. Such due diligence should ensure legal and safe data collection. Drones are revolutionizing the research world, industry, and the environment at large. The technology has untold potential for modernizing approaches to time- and energy-intensive tasks while improving documentation and imagery, environmental conservation, and, ultimately, quality of life around the world. When it comes to drones in the geosciences and environment at large, the sky is the limit. This work was supported by an award from Gryphon Sensors, LLC; the Syracuse Center of Excellence; and the Center for Advanced Systems and Engineering at Syracuse University. Special thanks for supporting flights and image processing go to Jacqueline Corbett, Ian Joyce, and Peter Cattaneo. Brownlow, R., et al. (2016), Methane mole fraction and δ13C above and below the trade wind inversion at Ascension Island in air sampled by aerial robotics, Geophys. Res. Lett., 43(22), 11,893–11,902, https://dx.doi.org/10.1002/2016GL071155. Di Mauro, B., et al. (2015), Mineral dust impact on snow radiative properties in the European Alps combining ground, UAV, and satellite observations, J. Geophys. Res. Atmos., 120, 6,080–6,097, https://doi.org/10.1002/2015JD023287. Federal Aviation Administration (2017), Small unmanned aircraft systems, Advis. Circ. 107-2, 1 p., U.S. Dep. of Transp., Washington, D. C., https://www.faa.gov/uas/media/AC_107-2_AFS-1_Signed.pdf. McGonigle, A. J. S., et al. (2008), Unmanned aerial vehicle measurements of volcanic carbon dioxide fluxes, Geophys. Res. Lett., 35, L06303, https://doi.org/10.1029/2007GL032508. Moore, J. (2017), Drones deliver storm response, Aircraft Owners and Pilots Assoc., Frederick, Md., https://www.aopa.org/News-and-Media/All-News/2017/September/18/Drones-deliver-storm-response. Nieminski, N. M., and S. A. Graham (2017), Modeling stratigraphic architecture using small unmanned aerial vehicles and photogrammetry: Examples from the Miocene East Coast Basin, New Zealand, J. Sediment. Res., 87(2), 126–132, https://doi.org/10.2110/jsr.2017.5. Ore, J.-P., et al. (2015), Autonomous aerial water sampling, J. Field Robotics, 32, 1,095–1,113, https://doi.org/10.1002/rob.21591. Rippin, D. M., A. Pomfret, and N. King (2015), High resolution mapping of supra-glacial drainage pathways reveals link between micro-channel drainage density, surface roughness and surface reflectance, Earth Surf. Processes Landforms, 40(10), 1,279–1,290, https://doi.org/10.1002/esp.3719. Spence, C., and S. Mengistu (2016), Deployment of an unmanned aerial system to assist in mapping an intermittent stream, Hydrol. Processes, 30, 493–500, https://doi.org/10.1002/hyp.10597. Vivoni, E. R., et al. (2014), Ecohydrology with unmanned aerial vehicles, Ecosphere, 5(10), 130, https://doi.org/10.1890/ES14-00217.1. Marlowe Reardon, Department of Television, Radio, and Film, Syracuse University, N.Y.